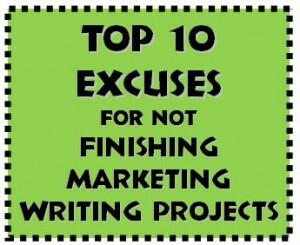 When you have marketing writing projects on your to-do list, how many excuses do you come up with to put off doing them? Busy professionals often focus their time and effort on delivering the service that makes them money. This is makes sense. Yet, when it comes to marketing your business and getting new clients, you do have to keep your pipeline full. To do that, you need to spend some time marketing on a regular basis. Many experts agree that 20% of your time should go to marketing activities. You want to stay top-of-mind with your peeps and you need to constantly generate leads and new prospects too. Whether you rely on email marketing, blogging, article marketing, social media, or direct mail, they all have one thing in common – the written word. As a long-time freelance writer, I’ve noticed most business owners have a lot of trouble getting their writing projects done. Those projects tend to sit in on a shelf somewhere gathering dust, waiting for the right time. Sadly, that day doesn’t seem to show up. The time is never quite right and there is always something more pressing. Any fire will take precedence of your writing projects. That’s why I wanted to share my top 10 favorite excuses gathered from over 20 years working as a writer to see if any of them sound familiar to you. So, do you hear yourself in any of these excuses? Here’s my attitude about business. There are a lot of things I don’t have time to learn or get done. That’s why I make money – so I can hire experts to do things I don’t know how to do or simply don’t want to do. Things like my taxes – I’d never do turbo tax because I feel a well-trained human can probably do a better job. Lots of grey areas require thinking, not software in my book. I don’t dye my own hair either. Been there done that, lived through the nightmare! I pay my stylist to do my color, cut and highlights now to be sure I always look my best. I don’t edge my garden beds anymore either. I have too many and quite frankly, it’s a back breaking job requiring more time than I care to spend. Even though I want my garden areas and yard to look good, I just can’t do it myself. Are you catching my drift? Hire an expert to get your writing projects done! Whether you haven’t jotted down a single word or your project just needs some finishing touches, call me at 203-877-3777. Then you can cross writing off your list. Won’t that feel wonderful when your writing projects are no longer hanging over your head? I’m here to help and am ready when you are. What are you waiting for?